A well-written chatbot not only can substitute for a living person and mimic a natural conversation, but it’s also available twenty-four hours, seven days a week. It makes your business more approachable and accessible. Consumers are more impatient these days and want to have immediate answers. Otherwise, they might turn to your competitors. Obviously, a chatbot will never be able to replace a human-to-human interaction, but it can definitely help prospects and clients in finding necessary information about your business. There are many services available on the market, but I would like to show you why you should be interested in DialogFlow. DialogFlow (previously API.AI) is a service which provides a complete product to implement voice- and text-based conversational interfaces. It employs Machine Learning to conduct a conversation as naturally as possible. The whole process can be done using the simple UI in DialogFlow’s web console. 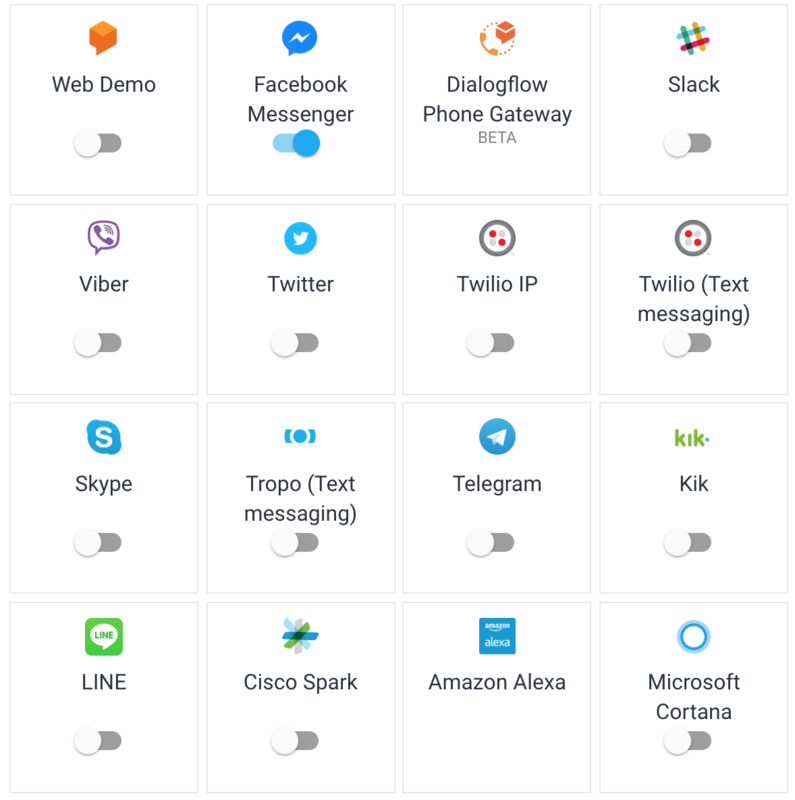 Easy integrations with various services (Facebook Messenger, Slack, Skype, etc), easy implementation on every platform (web, mobile), the option of adding a backend with some logic, integrated Small Talk function - there are many advantages which make DialogFlow a compelling choice. You don’t need to know a programming language to build your first chatbot. Add some phrases to which the chatbot should respond, add a few responses, some chips with suggestions, and that’s it. Responses with website cards, images carousels, audio files, etc. 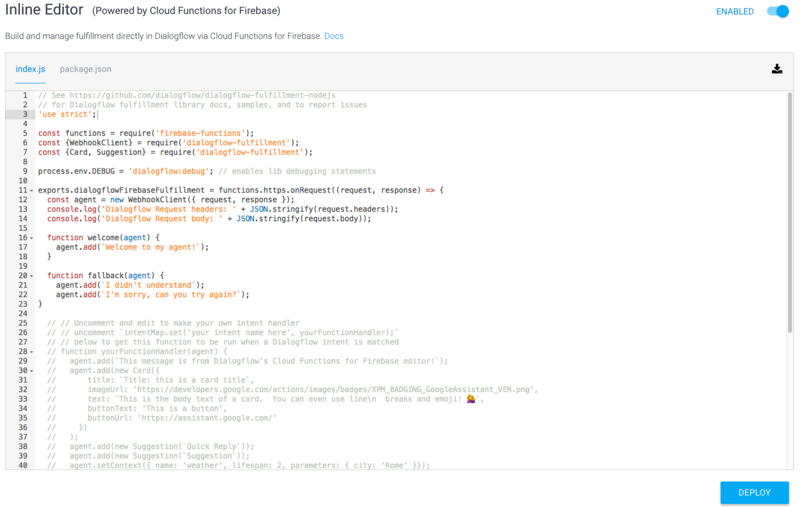 Create your own entities and use parameters in phrases or responses. Follow up every response and create full conversations using a huge tree of followed-up requests and responses. Support for over a dozen languages. Use one conversation template and just translate the phrases/responses. DialogFlow can be easily integrated with many external services. Do you want to create a Facebook Messenger chatbot for your business’s Facebook page? A few clicks and it’s done. 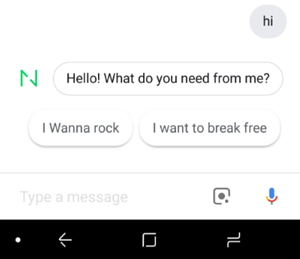 Maybe you need some Google Assistant actions which will be available for your friends or company? Or an autoresponder on Slack? Not a problem. One interesting feature is that every service can have different responses for every phrase. The whole process is straightforward. From most of these services, DialogFlow requires only an access token, and the rest of the magic happens itself. Those integrations look okay, but what if we want to implement a chatbot in our website or mobile application? That’s easy too. 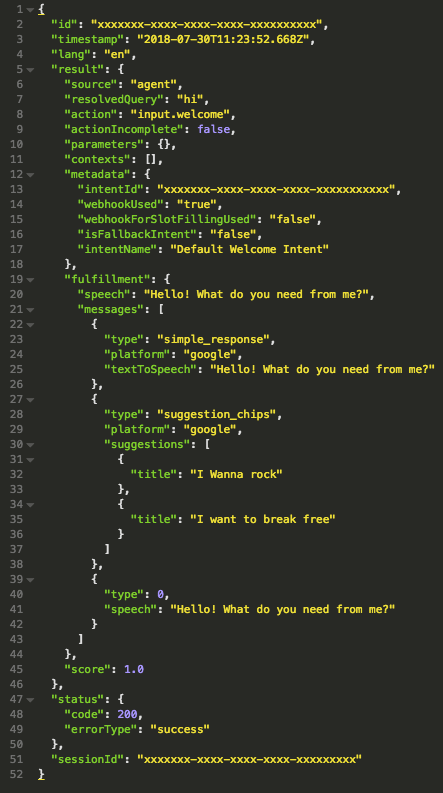 The DialogFlow API is well-documented and uses Google Cloud (or access tokens in API v1) as the authentication method. Requests and responses are just JSON files with all the info and data which need to be implemented on the application side. Additional helpful feature that may convince your users to participate in a natural conversation is an integrated function which provides automatic responses to some common phrases like “How are you?”, “I just want to talk” or even “Give me a hug”. At Netguru, we had the chance to implement DialogFlow in practice. We were looking for a service which would allow us to prepare many conversation scenarios using NLP (natural language processing) for one of our commercial clients – Temi. Temi is a personal robot built by an Israeli company, Roboteam. Netguru partnered with them on building the operation system for the robot and DialogFlow was a bull's-eye. Thanks to NLP, we can ask Temi things like “what is the weather in Warsaw?”. NLP will find two keywords here - weather and Warsaw. Basing on weather, Temi will launch the Weather view and based on Warsaw, he knows what place we want to check. 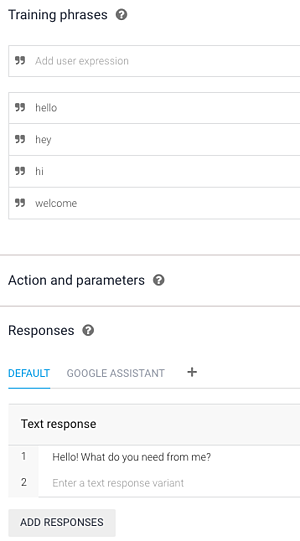 Temi logic uses DialogFlow conversation JSONs and thanks to TTS (Text-to-speech) it leads a natural conversation with the user. You can read more about the project in our case study and the interview.